Patch error from Grand Chase? Yup. I haven’t played this game since June of 2011, yet, I have come back to it. I installed it almost 3 weeks ago but I kept getting a patch error in the end of the patching session with a file named grandchaseus.ini being stuck. I couldn’t find a solution online whatsoever — not even from the official U.S. forum of the game. So I waited for the next patch to see if that would fix my problem. Two weeks passed and the newest patch release didn’t help the problem. I then tried Windows XP under a virtual machine, but the same problem occurred. This patch error was starting to annoy me. I was feeling nostalgic! I wanted to play the game! 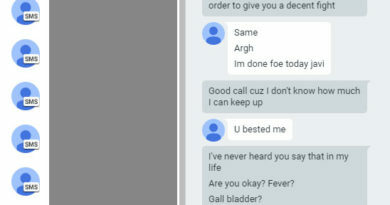 I contacted 1:1 Support but they asked me to do some analysis first on my computer and show them the details. Right after I sent it, I then remembered that I have had problems with VMWare before because of Comodo Firewall. Open Comodo Firewall and click on the Firewall tab. Windows Explorer will open up so that you can go look for a file that you want highlighted as a trusted application. On this window, go to the Grand Chase folder located at�C:\SG Interactive\Grand Chase (this path works for all versions of Windows). On the Grand Chase folder, look for grandchase.exe. Now, repeat step 2 and 3 but instead of picking grandchase.exe again, pick�main.exe. 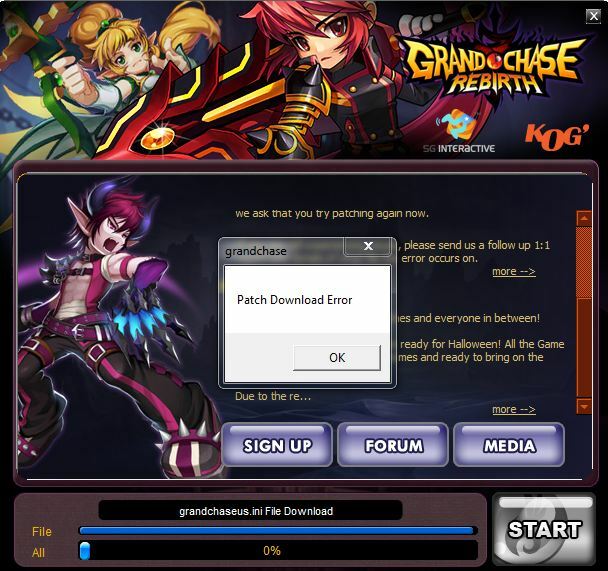 Repeat step 2 and 3 again but this time go to the GameGuard folder (located inside the Grand Chase folder itself) and look for that famous file that causes the patch error named grandchaseus.ini�(it may also appear as GrandChaseUS.ini). 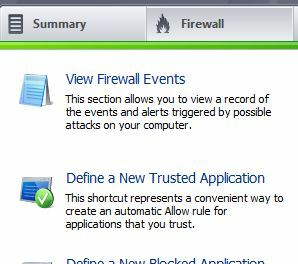 Now close that mini window called Define a New Trusted Application and go to the Defense+ tab (located next to Firewall). On this tab, click on the Trusted Files�link. It will start scanning stuff, so let it finish. On this window, you’ll do exactly the same thing as you did on the trusted application options. But since it’s a tad different, I’ll continue with the guide for those that are computer illiterate. 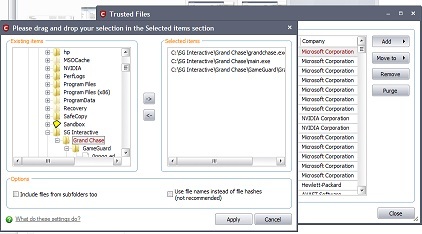 So on this�Trusted Files�window, click on the Add button and choose the Browse Files… option. On this new window that opens you’ll see a box on the left called Existing items with a list inside. Look for Computer�and click on its + icon to open a list under it. Open Local Disc (C:), then SG Interactive, and then Grand Chase. Now highlight the same files from before. First highlight grandchase.exe and then click the -> arrow to have it in the Selected items box. Then highlight main.exe to do the same thing. After that, go up a bit to open the GameGuard folder where you’ll highlight the grandchaseus.ini file to also move it to the Selected items list. Hit Apply, close Comodo Firewall, and now you can go have fun with Grand Chase! The game will re-patch and all will be good. This fixes the patch error caused by Comodo Firewall for Grand Chase. Patch Error or Other Grand Chase Questions? Leave a comment below if your folder locations are different and want help with that (or anything else that you may think I can help you with). In the U.S., Grand Chase has moved from provider to provider, so the folder locations do change. Oh, and by the way, my anti-virus is Avast! but it doesn’t block Grand Chase. So don’t go blaming it on this anti-virus. If you have McAfee, then all you have to do is white list the same files I mentioned above. I don’t know about other firewalls and anti-virus programs, but this method should work just the same.